I woke up Saturday morning dreaming of yarn. I had an overwhelming desire to go through my yarn stash for inspiration, so I decided to do a little reorganizing while I was at it. I usually keep everything in shoebox-sized boxes from ikea inside my armoire, but keeping everything contained in boxes makes it easy to forget some of the goodies that lurk under those lids. I still have some yarn in boxes (the brown and white flowered boxes in the background of the top shelf), but I decided to display my favorite yarns front and center, so I can be inspired. I open these doors every day and smile while contemplating what I want to knit with each skein on that shelf. I have many colors of Palette, which are lined up and at the ready for all the hexipuffs I’ve been knitting for my Beekeeper’s quilt; a skein of Shelter, leftover from the Guernsey Wrap I knitted last year which is dying to be knitted into a tweedy beanie; a luscious skein of Jade Sapphire cashmere, waiting for something that is worthy of cashmere; and lots of soft wonderfully tweedy Rowan Felted Tweed, which I am completely in love with and can’t wait to knit with again. The bottom shelf holds the fabulous crocheted Henry that my sister in law made for me and the panda bear I made after I forced her to show me how to do amigurumi. I have a basket full of hexipuffs, and some of my favorite knitting books– lots of Elizabeth Zimmerman and a few Vogue Knitting Stitchionaries for good measure. 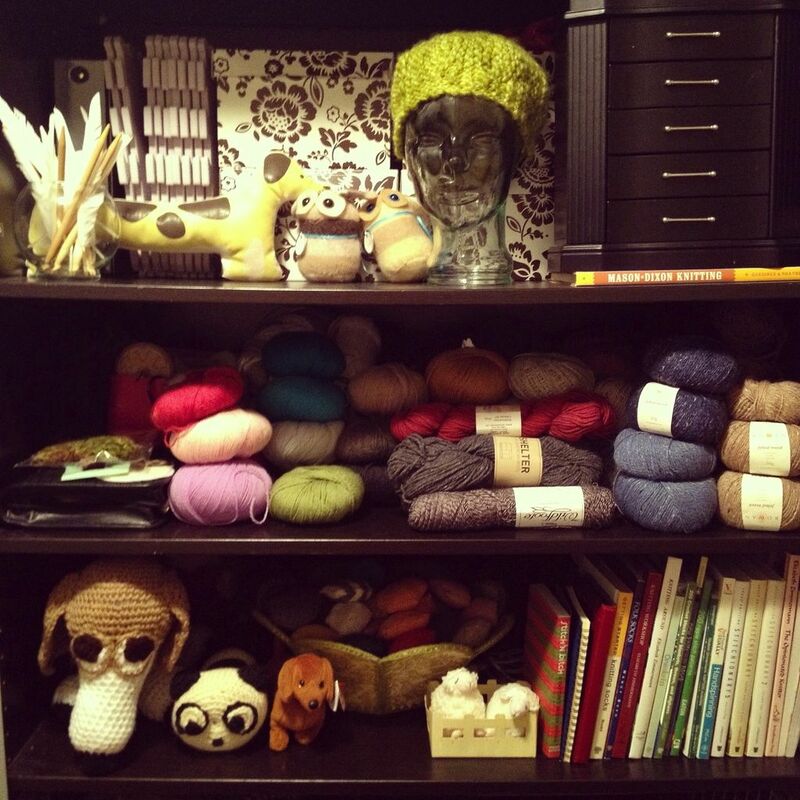 I’d love to know what yarns and books you’d bring to a stash party. Please let me know in the comments or post a link to your blog post if you’d like to join in and share. I recently posted about my larger than expected yarn stash – http://agujasblog.com/2012/08/20/16112-yards-of-yarn/. Yarn is quite lovely to look at, isn’t it? What a great idea — that room has to be magical. I’ll happily join book, pattern, yarn stash swaps. Just tell me when and how.